This entry was posted on May 31, 2016 by Josh Biggers. 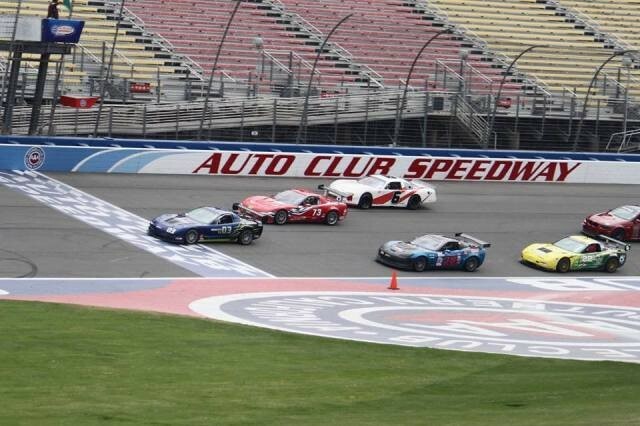 The Tway Motorsports/PA Construction Racing Corvettes fought through a tough race at Auto Club Speedway in Fontana, CA. 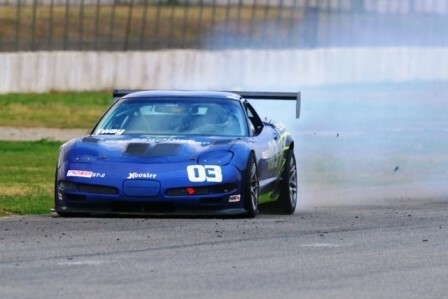 With the debut of the #03 Corvette, the team aimed towards making it a one, two podium finish. Unfortunately, it wasn't possible this time around as the #03 Corvette had an engine failure on the last lap preventing him from finishing. "After a year of rebuilding, I was finally able to race the #03 car again last weekend at Auto Club Speedway. Robert Hall also made his first race of the season in the #57 Corvette. Our two car team entered into the Super Touring 2 class for the race, while Robert also entered his car into the Time Trials (TT-1 class). Robert ended up winning TT-1 on Saturday and taking 2nd on Sunday. Great job for his first outing since last November." "Qualifying Saturday was tight, even more so was the schedule. Running 2 cars and time trials, we didn't have enough time to mount new tires and get to the grid early enough to be at the front for qualifying. Pre-grid is like a Southwest flight, first come first serve. We both had to deal with traffic during qualifying and were only able to put down 1:45 sec laps, while the front of the field ran 1:43's. We started 4th and 5th respectively for the race." "I had full intention and driving like a mad man at the drop of the green flag. Most racers at Auto Club take it easy on lap one, going around the oval and brake way early for the turn into the infield. I had full intention of taking advantage to make my way up. Well, a mis-shift squashed those plans. I had dropped to 8th before we got to the start line. Luckily, my strategy still worked and I was able to get most of the positions back before we hit the infield, and I slotted in behind Robert." "We ran hard for 2 laps until a BMW stuffed into the wall outside turn 4, causing a full course caution. This was great for me, because my oil and water temps were running high. We restarted five minutes later and got in 3 more hot laps until another BMW stuffed into the same exact wall. Officials threw the full course caution flag again and the checker flag this time. Robert would finish in 3rd for his first podium ever in a NASA Super Touring race, and I finished 4th." "I took the #03 car home Saturday and relocated my oil cooler and ran new lines hoping to fix the high engine temps. Confident after the morning warm up showed a 40 F degree drop, we were ready for qualifying. This time, Robert and I were able to start qualifying near the front and it paid off for me, running a personal best 1:42.7 lap, claiming the pole position for the race. Robert bested his Saturday time with a 1:44, and would start in 5th again." "This time, when the green flag dropped, I shifted well and had the lead for the first lap, until Chuck got me at the end of the back straight. I didn't let him go and swarmed him for the next 3 laps. On lap 4 though, my water temp started to rise again. RATS! I had to back out of the throttle and get the car cool. I managed to stay within a couple seconds of Chuck, while keenly eyeing Oli's yellow Corvette in 3rd, which was getting bigger and bigger. He finally caught me and passed me. I got him back a lap later." "With about 2 laps to go, I started to push the car again to catch Chuck and make a pass for the win. My plan was foiled a lap later, when my motor let go in a plume of white smoke on the back straight. Meanwhile, Robert had a tough time with some out of class cars and got caught in lap traffic. He would end up finishing 4th. There was a silver lining, I broke the Super Touring race lap record with a 1:43.2." Below is an on-board race video from a fellow competitor. 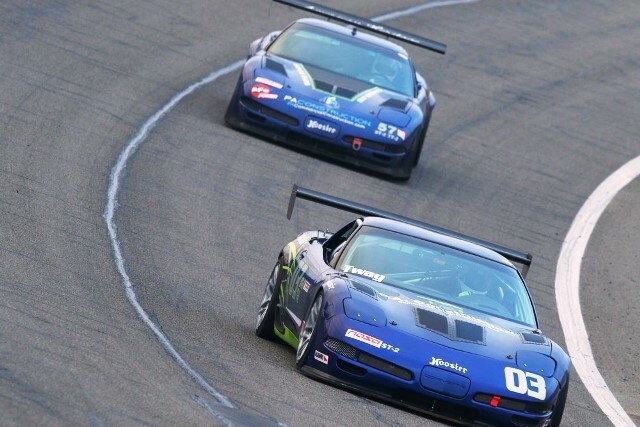 The video shows the great battle Jim (In the #03 Corvette) and Chuck in the #38 Corvette C6. Next month the team heads to Buttonwillow Raceway.